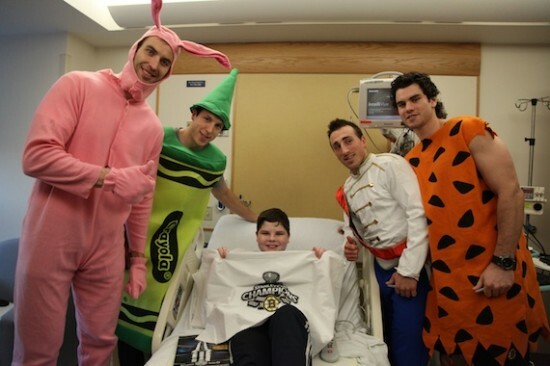 This day, I’m obsessed with finding pictures of Zdeno Chara of the Boston Bruins, that MONSTER I discovered in this Random n’at, in which he makes regular-sized people look positively Lilliputian in stature. This seriously needs to be someone’s Tumblr. OMG, I opened your nekid link just as this older woman was sneaking up behind me to tell me she was going to the bank and we both just laughed until we cried. Why does he play hockey and not basketball?! Fee, fi, fo, fum, I smell the blood of a Canadieum. Puck still stays on the ice, for the most part, doesn’t it? Still, that’s what we’ll have to deal with sometime this coming spring. Never too early to start bringin’ the hate, people. Relax, Hittsburgh. We don’t mean you this time. I love the guy in the background of the first photo. Looks like he crapped his pants. It almost doesn’t seem fair that he can play hockey. Scary. If I saw him flying down the ice towards me, I would just give him the puck and race the other way. Conversely, if you google pictures of Steve Sullivan, everyone else looks Chara-sized. Menfolk, don’t click on the Googly-Eyes link. @2 lipreadergalore, Because hockey is sport for men and basketball is a sport for sissies. Scott, Now you tell me. I can’t unsee that. I love how when I mouse over the googly eyes photo of Chara, my mouse pointer turns into a magnifying glass. As if any of those man’s parts are small enough that I should need one. Even his pores and hair follicles are huge. How tall is Chara? Seriously, don’t make me look it up. I may start watching Bruins games just to see him skate. My goodness. He looks.. well, yeah, a little unnatural, and if I saw him skating toward me I would skate the other way screaming. I would also love to take a picture of him with my children clustered around his ankles. in that last pic, he looks like a really tall bottle of pepto bismol. My mind keeps trying to put my husband (very tall, but not this tall) in a picture next to Chara and it is boggling over how even he would look diminutive in stature. He kinda reminds me of the rabbit in Donnie Darko in that costume. Also, this post is inspiring me to see if I can find a pic of Chara next to Martin St. Louis. I am so glad that someone shares my love of seeing Chara making everyone else in the world look puny! It never fails to crack me up and your captions brought on some giggles. Seeing him matched up with Martin St. Louis is particularly priceless. @ Ug Lee – isn’t that Chara with St. Louis in the second to last picture in this post? It looks like his face, anyway.